Marx's 'Das Kapital' Lives On in Capitalist Age Francis Wheen, biographer of Karl Marx, argues that as long as capitalism endures, Marx's masterwork, Das Kapital, will be required reading. First published in 1867, Marx's influential critique laid the groundwork for thinkers and revolutionaries to follow. 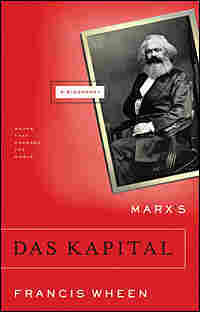 Francis Wheen, biographer of Karl Marx, argues that as long as capitalism endures, Marx's masterwork, Das Kapital, will be required reading. First published in 1867, Marx's influential critique of capitalism laid the groundwork for thinkers and revolutionaries to follow. In his "biography" of Marx's treatise — the latest in the Grove/Atlantic Books That Changed the World series — Wheen writes that Marx describes "a world in which humans are enslaved by the monstrous power of inanimate capital and commodities." The biography sheds light on Marx's childhood, his experience of alienation, and his 20-year struggle to complete his unfinished masterpiece. Although Das Kapital is usually categorized as a work of economics, Karl Marx turned to the study of political economy only after many years of spadework in philosophy and literature. It is these intellectual foundations that underpin the project, and it is his personal experience of alienation that gives such intensity to the analysis of an economic system which estranges people from one another and from the world they inhabit - a world in which humans are enslaved by the monstrous power of inanimate capital and commodities. His father encouraged Karl to read voraciously. The years of annexation had given Heinrich a taste for French flavours in politics, religion, life and art: one of his grandchildren described him as 'a real eighteenth-century "Frenchman" who knew his Voltaire and his Rousseau by heart'. The boy's other intellectual mentor was Heinrich's friend Baron Ludwig von Westphalen, a cultured and liberal government official who introduced Karl to poetry and music (and to his daughter Jenny von Westphalen, the future Mrs Karl Marx). On long walks together the Baron would recite passages from Homer and Shakespeare, which his young companion learned by heart - and later used as the essential seasonings in his own writings. In adult life Marx re-enacted those happy hikes with von Westphalen by declaiming scenes from Shakespeare, Dante and Goethe while leading his own family up to Hampstead Heath for Sunday picnics. As Professor S. S.
Prawer has written, anyone in Karl Marx's household was obliged to live 'in a perpetual flurry of allusions to English literature'. There was a quotation for every occasion: to flatten a political enemy, enliven a dry text, heighten a joke, authenticate an emotion - or breathe life into an inanimate abstraction, as when capital itself speaks in the voice of Shylock (in Volume I of Das Kapital) to justify the exploitation of child labour in factories. To prove that money is a radical leveller, Marx quotes a speech from Timon of Athens on money as the 'common whore of mankind', followed by another from Sophocles' Antigone ('Money! Money's the curse of man, none greater!/That's what wrecks cities, banishes men from home,/Tempts and deludes the most well-meaning soul,/Pointing out the way to infamy and shame...'). Economists with anachronistic models and categories are likened to Don Quixote, who 'paid the penalty for wrongly imagining that knight-errantry was equally compatible with all economic forms of society'. Marx's earliest ambitions were literary. As a law student at the University of Berlin he wrote a book of poetry, a verse drama and even a novel, Scorpion and Felix, which was dashed off in a fit of intoxicated whimsy while under the spell of Laurence Sterne's Tristram Shandy. After these experiments, he admitted defeat: 'Suddenly, as if by a magic touch - oh, the touch was at first a shattering blow - I caught sight of the distant realm of true poetry like a distant fairy palace, and all my creations crumbled into nothing... A curtain had fallen, my holy of holies was rent asunder, and new gods had to be installed.' Suffering some kind of breakdown, he was ordered by his doctor to retreat to the countryside for a long rest - whereupon he at last succumbed to the siren voice of G. W. F.
Hegel, the recently deceased professor of philosophy at Berlin, whose legacy was the subject of intense dispute among fellow students and lecturers. In his youth Hegel had been an idealistic supporter of the French Revolution, but by middle age he had become comfortable and complaisant, believing that a truly mature man should recognize 'the objective necessity and reasonableness of the world as he finds it'. According to Hegel, 'All that is real is rational,' and since the Prussian state was undoubtedly real, in the sense that it existed, his conservative supporters argued that it must therefore be rational and above reproach. Those who championed his more subversive early work - the Young Hegelians - preferred to quote the second half of that dictum: 'All that is rational is real.' An absolute monarchy, buttressed by censors and secret police, was palpably irrational and therefore unreal, a mirage that would disappear as soon as anyone dared touch it. For a while, Marx seemed uncertain how best to use all that erudition. After gaining his doctorate he thought of becoming a philosophy lecturer, but then decided that daily proximity to professors would be intolerable. 'Who would want to have to talk always with intellectual skunks, with people who study only for the purpose of finding new dead ends in every corner of the world!' 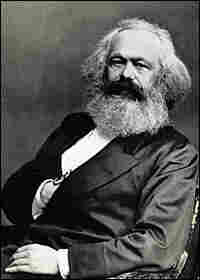 Besides, since leaving university Marx had been turning his thoughts from idealism to materialism, from the abstract to the actual. 'Since every true philosophy is the intellectual quintessence of its time,' he wrote in 1842, 'the time must come when philosophy not only internally by its content, but also externally through its form, comes into contact and interaction with the real world of its day.' That spring he began writing for a new liberal newspaper in Cologne, the Rheinische Zeitung; within six months he had been appointed editor. Marx's journalism is characterized by a reckless belligerence which explains why he spent most of his adult life in exile and political isolation. His very first article for the Rheinische Zeitung was a lacerating assault on both the intolerance of Prussian absolutism and the feeble-mindedness of its liberal opponents. Not content with making enemies of the government and opposition simultaneously, he turned against his own comrades as well, denouncing the Young Hegelians for 'rowdiness and blackguardism'. Only two months after Marx's assumption of editorial responsibility, the provincial governor asked the censorship ministers in Berlin to prosecute him for 'impudent and disrespectful criticism'. Karl Marx married Jenny von Westphalen in June 1843. For the rest of the summer, while awaiting their summons to Paris, he and his new bride enjoyed an extended honeymoon in the fashionable spa resort of Kreuznach. When not walking by the river he shut himself away in a workroom, reading and writing with furious intensity. Excerpted from Marx's Das Kapital: A Biography Copyright 2007 by Francis Wheen, reprinted with permission of Atlantic Monthly Press, an imprint of Grove/Atlantic, Inc.